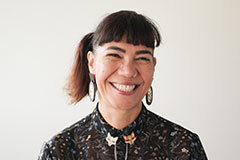 After 27 years in Melbourne, Australia, Kim Tairi was drawn home. Kim, who has 20 years’ experience in the tertiary sector, is passionate about providing access to knowledge and learning. She was lured back by AUT’s passion, diversity and commitment to tika, pono and aroha. “I’ve always worked for universities of technology. They tend to be younger, more nimble and not so traditional in their approach. You can get things done. Kim jokes that she used to be terrified of school librarians, and although times have changed she acknowledges ‘libraries are quite daunting places when you start at university’. “In terms of our place in the community, it’s really important that we offer a great student experience to ensure that the library is a welcoming and engaging place. The future of libraries, Kim says, is about co-locating different services within an exciting, dynamic environment. In 2017, with support from Student Services & Administration, they developed a radical new space within the library, and it's this cross-border collaboration that Kim loves.